Forty years ago, when a young Ginny Gilder stood on the edge of Boston’s Charles River and first saw a rowing shell in motion, it was love at first sight. Yearning to escape her family history, which included her mother’s emotional unraveling and her father’s singular focus on investment acumen as the ultimate trophy, Gilder discovered rowing at a pivotal moment in her life. Having grown up in an era when girls were only beginning to abandon the sidelines as observers and cheerleaders to become competitors and national champions, Gilder harbored no dreams of athletic stardom. Once at Yale, however, her operating assumptions changed nearly overnight when, as a freshman in 1975, she found her way to the university’s rowing tanks in the gymnasium’s cavernous basement. From her first strokes as a novice, Gilder found herself in a new world, training with Olympic rowers and participating in the famous Title IX naked protest, which helped define the movement for equality in college sports. Short, asthmatic, and stubborn, Gilder made the team against all odds and for the next ten years devoted herself to answering a seemingly simple question: how badly do you want to go fast? Course Correction recounts the physical and psychological barriers Gilder overcame as she transformed into an elite athlete who reached the highest echelon of her sport. 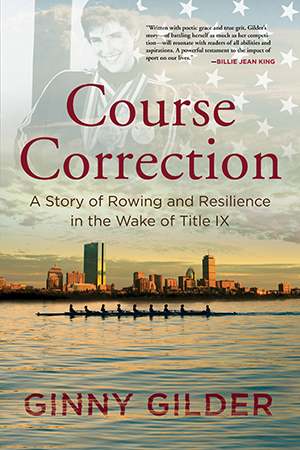 Set against the backdrop of unprecedented cultural change, Gilder’s story personalizes the impact of Title IX, illustrating the life-changing lessons learned in sports but felt far beyond the athletic arena. Heartfelt and candid, Gilder recounts lessons learned from her journey as it wends its way from her first glimpse of an oar to the Olympic podium in 1984, carries her through family tragedy, strengthens her to accept her true sexual identity, and ultimately frees her to live her life on her terms. I endured my first three days of college surrounded by budding Nobel Prize winners, already-published authors, and nonchalant geniuses speaking multiple languages in the course of a single conversation. I crept into my bunk bed for three nights straight, plagued by panic and vivid dreams of walking naked on campus. I woke every morning to a crowd of thoughts clamoring to present more evidence of my mistake. Too young. Not smart enough. Unprepared. Not Ivy League material. Whatever delusion of adequacy my admission to my father’s alma mater had encouraged evaporated like morning dew, and I was left to panic before the stark, unblinking truth: I was an interloper. I was trudging across Yale’s Old Campus to the Branford DiningHall for lunch on my fourth day when I saw a long wooden object inside the High Street gate. The shape looked vaguely familiar, although it seemed out of place. I walked up to take a closer look. Several metal triangles poked out from its middle. Its smooth, rounded bottom rested in a pair of scruffy canvas slings. Another fish out of water. For the first time since I arrived on campus, my chattering anxiety quieted. I reached out and touched the varnished wood, ran my hand along the grain and felt its glistening smoothness. I closed my eyes. I could hear the splash of oars and imagine flecks of water cooling my skin as the boat rocked me gently. A tall man with a faded John Deere baseball cap perched high on his head was handing out fliers and cheerfully calling out to passersby, “Hi there, you want to learn to row?” He had a long regal nose, proportionately prominent, matched by broad fleshy lips. His cleanshaven face was tanned to a burnished red, proof of time served in theweather. His blue jeans sat loosely on his hips and his long-sleeved, fraying denim work shirt was stained with oily grease. He talked only to girls, and only some. He spoke warmly and respectfully, inviting without pushing. He seemed to go for the taller ones and avoided the heavier-set girls. Most people stopped and listened politely, took the flyer he offered, and walked on. His warmth evaporated; his forehead creased as he tugged his baseball cap down to hood his eyes. His sudden, sullen retreat surprised me. “Uh, you do?” he replied. Hearing his reticence—not exactly the first no-confidence vote I’d ever heard—I felt something inside lock me into place, defiance clicking into determination. The universe had finally nudged my way and I was not going to squander this chance. I remembered sunlight dancing on water, the rush of calm that surrounded me as I watched those boats glide up the Charles River, like a soft embrace that I could lean into without falling. Nor did I forget the smoothness of the strokes and the orderly repetition of the rowing motion. Again I felt the stirring of an alien feeling: was this hope? He took his cap off and ran his hand through his thinning hair, then plopped the hat back on his head and adjusted the brim downward again. “Um, let’s see...,” he said. Nat Case, the varsity women’s crew coach, behaved entirely in character that first meeting. At 5´7?, I was a runt as a rower. Nat ascribed to the belief that mass moved boats: in choosing recruits, he sought out the advantage that height conveyed. I would discover he prized it above other, less obvious but more valuable traits. I pried out of him that learn-to-row sessions had already started in the gym and would continue every afternoon for the rest of the week. I gave him my name and made sure he wrote it on the schedule for the following day. I held out my hand for a flyer until he gave me one. “Thanks,” I said. “I’ll see you tomorrow.” My voice, perhaps, but the universe had spoken.